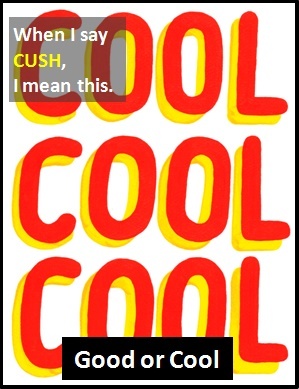 CUSH means "Good or Cool". (See also CUSHTY (Excellent or Comfortable)). The word CUSH is typically used in text messaging and chat forums, as well as in face-to-face conversations, to mean "Good or Cool". CUSH is believed to derive from the Romany Gypsy word Kushty, which is short for Kushtipen, meaning "Good". According to the Bible, CUSH (also spelled as�KUSH) was the eldest son of�Ham who was a son of�Noah, the man who built the Ark. Of note, CUSH should not be confused with KUSH (High Grade Cannabis). Steve: CUSH. I wouldn't miss it for the world. CUSH is a slang word which is probably a contraction of the Romany Gypsy word Kushtipen, meaning "Good". Some contractions, like AMP (Amplifier), use the opening letters of the fully expanded version. Other contractions, like Dr (Doctor), use letters from the start and end of the fully expanded version. Contractions can also be formed by replacing a letter(s) with an apostrophe (e.g., can't).